A berry-loving squirrel/pigeon has stripped all bar one of my gooseberry bushes of all the unripe fruit. I hope he/she had belly-ache. Being next to the hedge has its disadvantages, no one else seems to have lost theirs, yet. 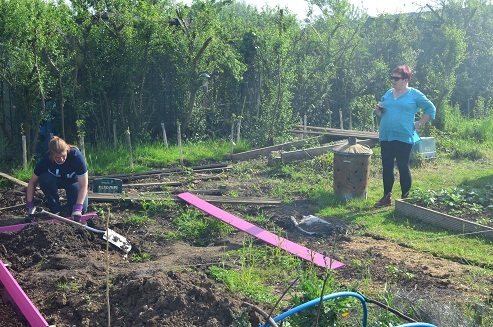 Edit to add photos – that’s me grafting on the allotment, under supervision post-BBQ (Maggie didn’t spend all afternoon observing and quaffing – but only got within camera range for this bit!). 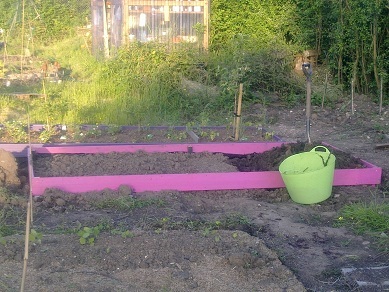 The soil in the pink bed absolutely stinks- it’s full of roots as thick as my wrist and is sodden and stagnant. Not so much fun! 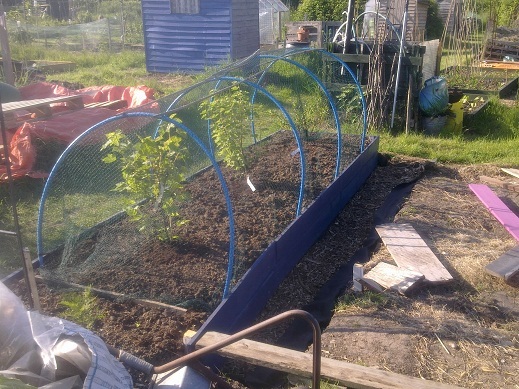 The much more pleasant top bed is finally done and has redcurrants and gooseberries in it. It will have strawberries too when the new netting arrives, this one is a bit too short but I really wanted to keep the remaining berries out of the local wildlife’s tummies….and there’s also a picture of (part of) me and Simples the meerkat from Exmoor Zoo, because that was one of the best hours this year so far, and I’d like a reminder on here.